Between new users, and long-time iPhone owners just getting into Siri, there are a lot of people trying out Apple's voice recognition technology every day —and getting upset that it's not exactly like a Star Trek computer. Siri does need training to be as good as it can, and to assist in that endeavor, there are a series of phrases and query construction tips to get started with. For the long-time user (or the older one), Siri may feel like a bad Infocom adventure game parser in the beginning, but it can be so much more flexible and accurate over time than it starts "out of the box." After initial setup, where Siri asks you to say a few phrases, it still needs education on your voice. Here's some guidance on how to structure some basic queries for simple iPhone tasks. There's really no compelling need to speak in anything other than your normal voice. In fact, speaking haltingly may confuse Siri, making it insert breaks in a query where you don't intend. If you're planning on using Siri a lot, speak to it normally, in your regular cadence. Your patience will be rewarded by more accurate interpretation the more you use it. One of the most obvious uses of Siri is in a moving car. After invoking Siri by whatever method you choose, Messages can be invoked by using "tell," "send," or "text." For instance, If you tell Siri to "Send a message to 867-5309" then it will ask you next what you want to tell that recipient —presumably Jenny. If Jenny is already in your contact list, You can say "text Jenny I lost my nerve" —note the lack of any connective phrasing between "text Jenny" and "I lost my nerve." 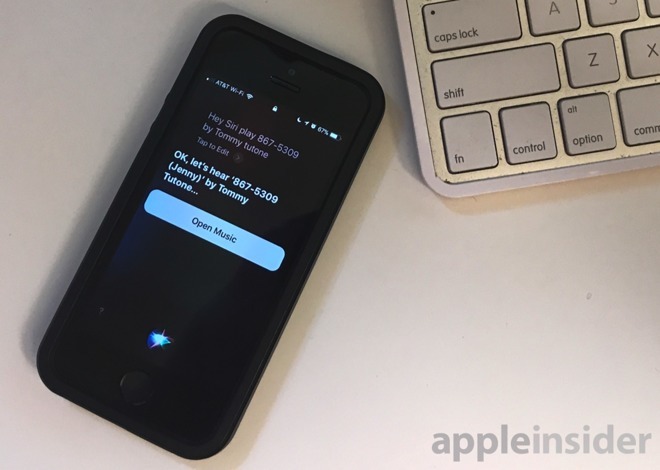 As Siri's training advances, a phrase like "Send a message to Jenny saying don't change your number" is quicker than in the early days of training. 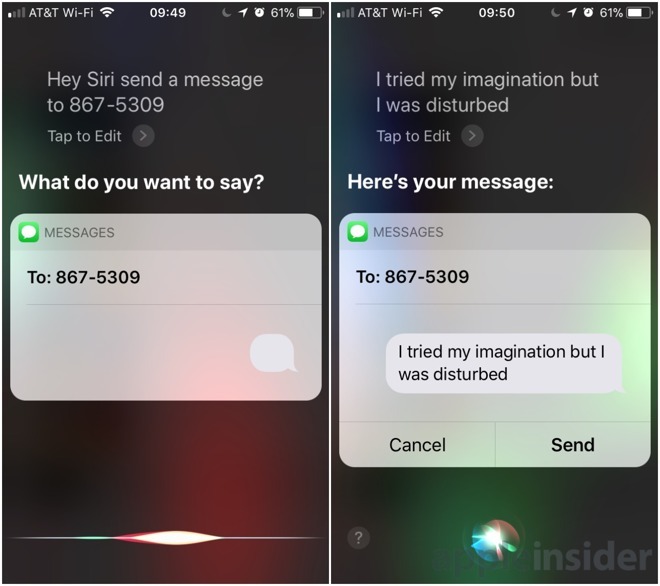 In this case, Siri will send "don't change your number," identifying the word "saying" as a connector. Responding, and finding Messages is simple. The best way to hear all of your new messages is simply to ask Siri to Read my new messages. You can interrupt the stream by saying Read it again, where "it" is the last message you just heard. If there is a single sender you want to hear from, you can ask Siri "what is my latest message from Jenny" and Siri will read it off for you. Siri still has a big limitation with Calendars. While it can draw data from any synced calendar, it will only add an appointment to the default one. As with messages, you can tell Siri to "set up a meeting at 4" —and Siri is smart enough to not put that at 4 a.m., and will ask for more details of the meeting. If you actually want it at 4 a.m., you can add "in the morning" or "am" to the query. 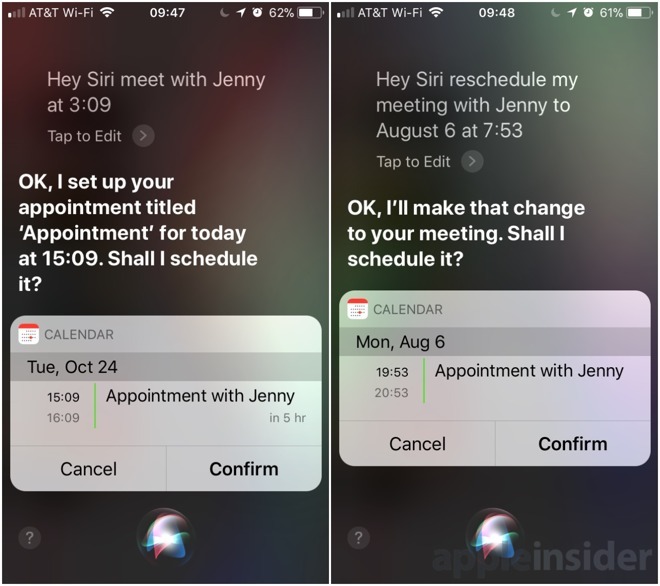 Alternatively, you can say "Meet with Jenny at 3:09" and Siri will inject that into your calendar, auto-filling Jenny's information. Siri is sufficiently aware enough that if you say "reschedule my meeting with Jenny to August 6 at 7:53" that it will take the next meeting with Jenny and move it to when you specify —but it will ask you for confirmation that what it has interpreted is accurate. Siri's integration with music really works best with Apple Music —and this will pay off in the HomePod later in 2017. We have also found that the iPhone microphone sometimes gets drowned out by the music —so voice commands work the best with audio from your phone playing on a different speaker or headphones. If you say "Play 867-5309 by Tommy Tutone," it will either play it from your library, or go get it from Apple Music. As a general rule if you leave the artist off, Siri and Apple Music default to the most popular version. 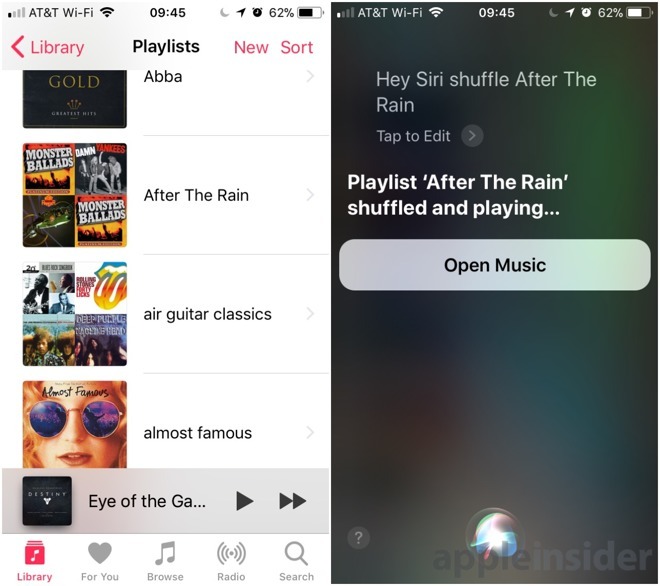 If you've done some work with Playlists either stored locally or distributed through iTunes Match or Apple Music, you can say things like "Shuffle After The Rain" and then "Pause," "Skip," or "Play." If you're playing an Apple Music station, can you tell Siri "don't play this song again," or "I like this song" to tailor a station. 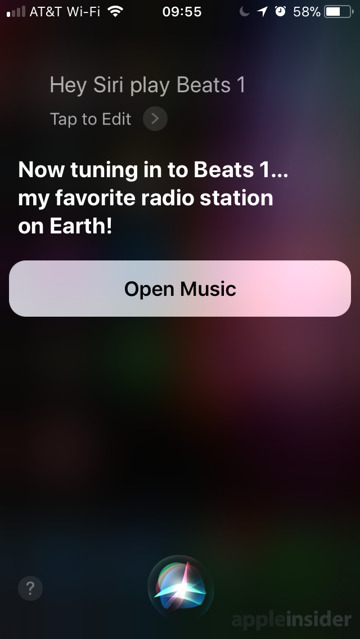 And, of course, you can say "Play Beats One" to bring up Siri's favorite radio station. Siri does sometimes get confused with other words it seems to have reserved. 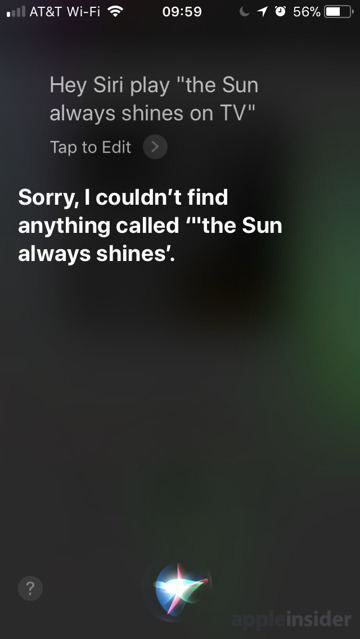 In the Tommy Tutone song's case, without the artist named, and just asking Siri to "Play 867-5309," it wanted to read back some of our voicemails. As another example, it appears to interpret the phrase "on tv" as a possible location for playback, as opposed to part of a song's title. Siri is still not perfect, obviously, and we're hoping for improvements here with the HomePod.